It was a snippet from an interview with London designer Basia Zaryzka that led Vicky Kidd-Gallichan to name her independent fashion label. “I was living in England and heard Basia say she creates gowns for rockstars and royalty. I thought it would be a fabulous name for a business,” says Vicky. Fast forward to 2007 and Vicky had moved to Canberra and opened Rockstars and Royalty, creating pretty princess gowns, rock ‘n’ roll-inspired pieces and glamourous cocktail dresses. It would be challenging to pick which side of the label suits Vicky’s personality best—no doubt it’s a bit of both. She loves colour, has been known to have bright pink hair and has a tattoos on both arms. Suffice it to say that it really doesn’t matter—everything Vicky turns her hands to turns out to be inspiring, whether fairy tale or edgy. Think, for example, about her collection, which she launched at the inaugural FASHFEST, Canberra’s four-day, red-carpet fashion event. Guests were transfixed with the beauty of each piece, including the gold and teal gown worn by the Face of FASHFEST 2013, super model Anneliese Seubert (see pic above). Her more recent Reign of the Forest collection, near and dear to Vicky’s heart, is just as stunning. Vicky was invited to style the Reign of the Forest shoot, by makeup artist Erin Pittard who was working with local photographer Lauren Campbell, and she grabbed at the chance. To style, Vicky used a selection of her hair pieces, some of her gowns, and vintage clothing and underwear from Sarina del Fuego and Swish Vintage. The all-day shoot was in winter at Canberra’s National Arboretum. Reign of the Forest. Model – Molly Folkard. These days, Vicky’s mind is still on wintery weather, but with her newest collection, Cherries in the Snow. She’s flat chat with the collection to be launched in just a couple of months at FASHFEST 2015. Each masterpiece takes Vicky up to 100 hours to make and the fashion designer is responsible for every stitch. The work is incredibly detailed and consumes every ounce of her stamina and patience. Cherries in the Snow is a 1950’s inspired collection named after the stunning shade of red lipstick Revlon has been selling since that era, and which Vicky still wears today. The new collection’s colour palette will start with snow white and fade into pastel pinks, rich reds and, finally, a black cherry. To create Cherries in the Snow, Vicky has ordered 15,000 crystals and 30 metres of intricate lace. She’s also ordered metres and metres of soft tulle, Chantilly lace and silk chiffon. Work has begun with Vicky experimenting and dying all the fabric herself. Vicky is incorporating a true wintery feel into Cherries in the Snow with feathery jackets, lace jackets, wraps and accessories. This is the third year Rockstars and Royalty has graced the catwalk at FASHFEST with a stunning collection of gowns and cocktail dresses. Vicky’s models are selected for the designer from the event’s annual casting–this year a record-breaker—for their ability to bring each piece to life for guests. Vicky opened Rockstars and Royalty in 2007 when she moved to Canberra from England. Her label is for women who don’t want a run-of-the-mill wedding dress or off-the-peg evening gown. “I design for women who aren’t afraid to stand out in the crowd,” says Vicky. 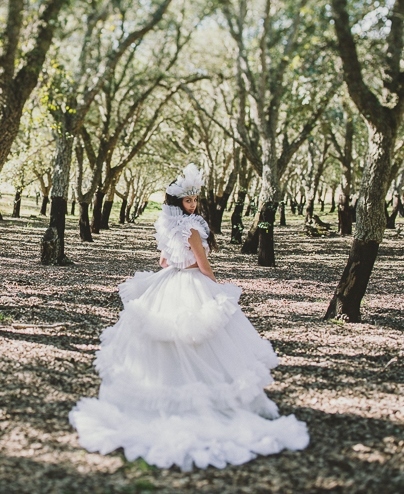 A professional corset maker, Vicky often incorporates Victorian-style corsets into her gowns. She also hand-makes a wide range of exquisite accessories, including hats, hair pieces and jewellery which she sells direct through Canberra markets, including the upcoming Hustle & Scout Twilight Market (11 April). This entry was posted in LFW Style and tagged FASHFEST 2015, Hustle and Scout Twilight Markets, National Arboretum, National Convention Centre, Rockstars and Royalty on March 11, 2015 by gracienumber1.